Want to know more of the trial and triumphs of IPC’s storied rise to becoming one of the largest African American Businesses in America? In 2006, Harvard Business School created a three part case study that chronicled the beginning years of IPC. It shares the details of the epic journey to ownership and success taken by our founder Al Fuller. These three case studies will provide you with amazing, unbiased insight into our operations, financials, and our core philosophy, while showing the tenacity our executive leadership team displays even through lean times. 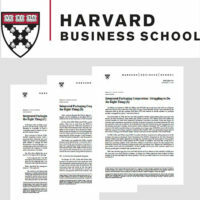 the Harvard Business School Case Studies on IPC.